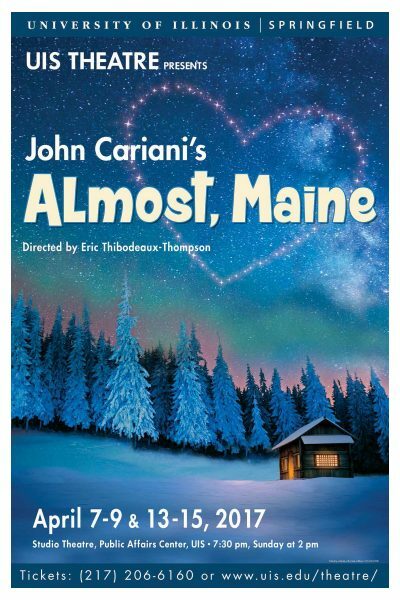 The Theatre Program at the University of Illinois Springfield presents “Almost, Maine” by John Cariani opening Friday, April 7. Six performances will be presented in the Studio Theatre, on the lower level of the Public Affairs Center at UIS, on Friday, Saturday, Sunday, April 7, 8, 9 and Thursday, Friday, Saturday, April 13, 14, 15. All shows will begin at 7:30 p.m., except the Sunday performance (April 9), which will begin at 2 p.m.
UIS Associate Professor of Theatre Eric Thibodeaux-Thompson will direct, with scenic design by UIS Assistant Professor of Theatre Dathan Powell. On a cold, clear, moonless night in the middle of winter, all is not quite what it seems in the remote, mythical town of Almost, Maine. As the northern lights hover in the star-filled sky above, Almost’s residents find themselves falling in and out of love in unexpected and often hilarious ways. Knees are bruised. Hearts are broken. But the bruises heal, and the hearts mend–almost–in this delightful midwinter night’s dream. The cast includes UIS students Katie Brethorst, Diamond Dixon, Shane Graham, Nicholas Jimenez, Alicia Madden, Christopher Vemagiri Marbaniang, Robert Rickey and Claire Starling. UIS staff member Michael Krcil is also part of the cast.